Posted on October 28, 2011 October 16, 2016 , in Atlas Polar, HIAB Crane. Concrete forming is an integral segment of the concrete construction industry, the other two being concrete finishing and material handling. It is aided by cranes that lift and place concrete forms that are required in the construction process. 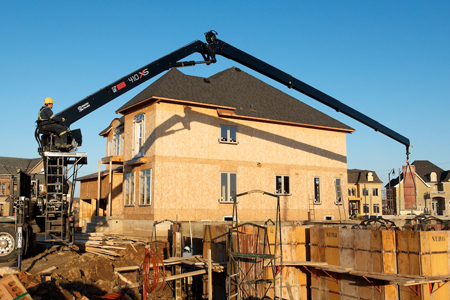 Now, builders have a safe, fuel-efficient and high-performance crane from HIAB that is specifically targeted at Canadian concrete forming. The HIAB XS 410K is a great addition to the company’s line-up of excellent truck-mounted cranes, and it is loaded with features that would make any owner happy. With a maximum 22.5m reach for a lifting capacity of 997kg, the XS 410K boasts fast and smooth operations with true proportion control. Its two boom design is aimed at delivering quick speeds and precise control, while its crane outriggers are mounted to the front for increased reach and ground clearance. The 410K’s load sensing variable displacement pump offers hydraulics on demand. This means that you can enjoy both high speed and fuel efficiency. Ergonomics and operator safety are two crucial aspects of any truck mounted crane. In this regard, the XS 410K does not disappoint. The main outrigger can easily be adjusted for deployment from the top seat, while the crane also offers the operator easy access to the top seat boom controls. You cannot talk about a HIAB crane and not marvel at the design features that make it such a durable unit. After all, truck mounted cranes from the manufacturer have the best resale value in the industry. The XS 410K’s 460 degree rack and pinion rotation system in oil bath guarantees lasting durability, while its smart design incorporating fewer parts keeps your maintenance hassles (and costs) low.